Discussion in 'iPad' started by seasurfer, Nov 25, 2012. I bought my iPad 4 on thanksgiving in Apple store, changed the first one because it looked really blue and not saturated. I got the second one, I looked really good in the Apple store. So I went home. Yesterday, I went to Bestbuy to shop, I noticed that this iPad looked more white to me? Then again today, I went to B&H and shop, I also noticed the one in B&H looked more white to me. 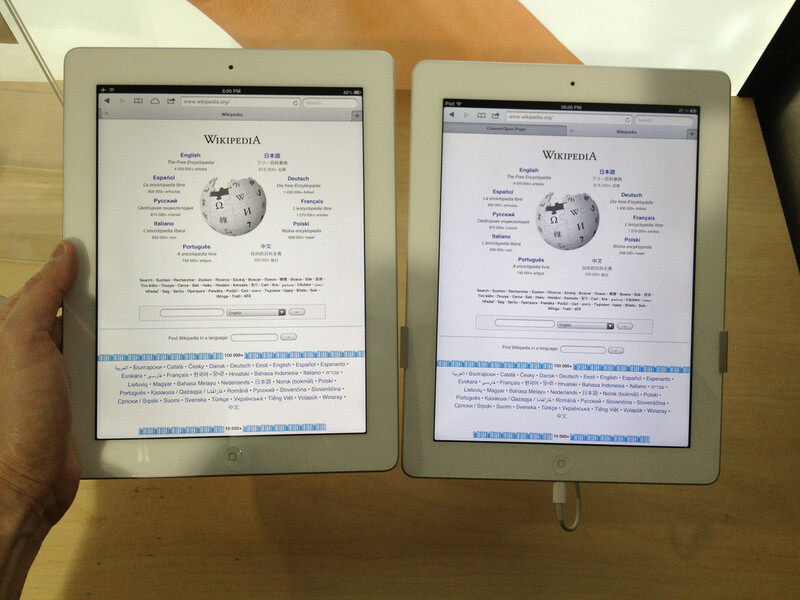 In the picture, the left hand side is my iPad 4, the right hand one is the one in Bestbuy. Tell me which one looked better? Not uncommon. There have been several reports over the years of this happening with screens with iPhones, iPads, and iPod Touches. Make an appointment at the Genius Bar at your local Apple Store and you should most likely walk away with a replacement iPad 4. Do it now rather than later since the first batch of replacement stock will be brand new iPad 4s where after that first batch has been gone through the next will be refurbished units. So I am not the only one that felt yellow. Nope. Only one of many. It's not necessarily a bad thing though. Some prefer the "yellowish tint". I've heard from a few members on here that the warmer hue (as many refer to as yellow) actually displays colors and saturations better than the cooler tint (also referred to as blue). Easy answer. Yours looks better. The blue tinted one is the less accurate one. Displays when properly calibrated will tend to look warmer than non-calibrated displays. Just going by the picture I can tell your display (the one on the left) is the better one. I guess they're just like headphones. We prefer a more "fun, exciting, and forward" sound (blue tint) rather than full balance across the spectrum. But in reality, the equally balanced sound across the whole line (warmer tint), is in fact the more accurate and displays the picture more in truth. This has gotten me all paranoid about my screen now! I actually noticed my screen looked warmer today but like everyone has said, It does look better. Plus I stare at Computer, iPad and iPhone all day for work and by the night time my eyes are usually burning. The warmer yellow doesn't hurt as much. I miss having f.lux app from Cydia. Girlfriend hated it but my eyes needed it. Next to the white bezel, the one on the right looks quite blue to me. If you look at the left one, you see blue lines around the whole screen next to the bezel. The screen is yellow, and around the whole screen you see a white/blue frame next to the bezel, is that normal? Isn't it a bad idea to do these kind of comparisons in store as the fluorescent lighting tends to skew the colors? Give your device a few days for the glue to set properly. This has been common with iPhones and iPad for years. 99% of the time it will fix itself within a week of use. No need to take it back to the store.